Discover how to build your own blog, website, or portfolio with Squarespace! Squarespace is a fast-growing all-in-one solution for creating and maintaining a blog, website, or portfolio that allows you to drag and drop various site elements and manage your finished product on the free Squarespace iPhone application. In this fun and friendly 224-page ebook, Squarespace For Dummies helps you discover the variety of modules to choose from, including blogs, maps, social network integration, HTML code blocks, photo galleries, and more. Packed with valuable information on how to maximize your website and the visitor experience, this guide offers tips for installing widgets, adding new widgets from third parties, and customization instructions. The author explains how Squarespace offers you the ability to use real-time visitor analytics, page rank tracking, and more. 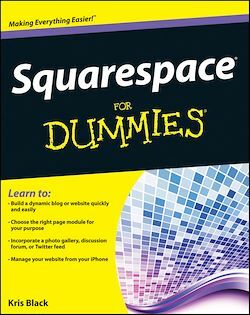 Squarespace For Dummies will get you started building your own website in no time!